Gene editing is defined as creating targeted changes in the genome using sequence-specific nucleases. The CRISPR (clustered regularly interspaced short palindromic repeats)/Cas9 (CRISPR-associated protein 9) system provides a gene editing tool that has led to significant advances in this field and the development of potentially curative strategies for a variety of disorders. 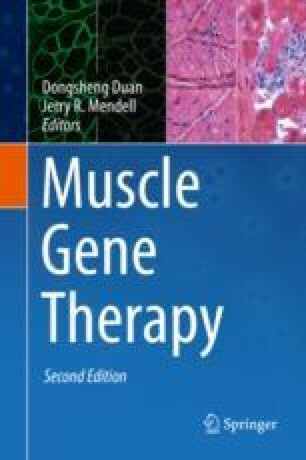 Most of the research on gene therapy and gene editing for muscle disorders has focused on Duchenne muscular dystrophy (DMD), a fatal, progressive X-linked neuromuscular disorder resulting from the absence of dystrophin. The molecular aspects of DMD present challenging obstacles to gene therapy; however, the versatility of the CRISPR system is providing ingenious ways of circumventing those obstacles. In this chapter, we review gene editing tools, notably zinc-finger nucleases, transcription activator-like effector nucleases, and CRISPR. We then discuss the uses of CRISPR in muscle disorders, focusing on DMD, as well as challenges inherent to gene editing of muscle cells.